Although these pear fritters are deep fried in the oh-so-health-conscious Canola oil, they are still not what you would call a diet food. I detest dieting. I know, you love it. I hear you. The only reason that I am even mentioning the terrible four letter word, never to be uttered aloud is because I voluntarily entered a crazy neighborhood “Biggest Losers Challenge”. I know, I’m a masochist…I do realize it’s almost Thanksgiving and Christmas baking is around the corner. Surprisingly though, it’s actually a riot. I have never had more fun shedding a few pounds in my entire life. Can you see why this weightloss was almost—dare I say—FUN, this time around?! Apparently, I am in this group of boozers, food lovers and comedians who have actually ALL LOST WEIGHT!!! You’re ready to jump in, aren’t you? My only complaint is to those very annoying pounds that are dropping from me ever so slowly. I have been spending the thoughtful parts of my weekend trying to piece together the mystery as to why I am not the big winner for this week, nor the big winner over the last three weeks. If you just click through a handful of the recipes on this site, I think you will connect the dots. Believe it or not, baking two or three times a week is NOT THE ANSWER to losing weight. I know, this is earth shattering information. So, lying in bed last night, while I contemplated what I would be making this morning for this post, I tossed around healthier, lighter fare. I had a beautiful bowl full of gorgeous pears begging to be used, and I knew that somehow pears would be in the picture. Poached pears would be nice, I thought, with a rich balsamic honey sauce, right? So light, so diet friendly, and maybe those pounds would drop off me just a little bit faster or at least not as slowly as molasses drops off a spoon. But then I awoke, and my mind was clear and Pear Fritters were the obvious—albeit diet disastrous— answer to my “What to Post?” question. They are really so delicious…they are worth it I promise you. I only ate two little fritters if that is any consolation. As I nibbled the last one, I contemplated packing up little “care packages” of fritters for my fellow dieters and anonymously dropping them on their doorsteps. Some read my blog though…I think I would have been walked off a plank somewhere or at least my front yard would have been “teepeed”. Ah well, diets have been sunk by far lesser and banal things than pear fritters. At least I went down in a fried and sugared dough ball of glory. 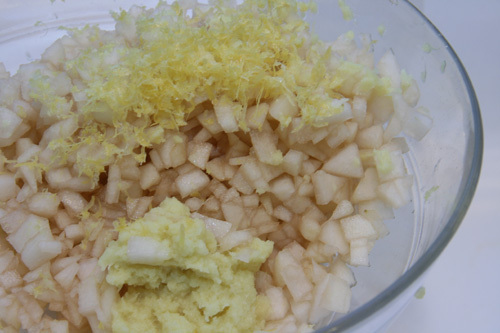 In a small bowl, combine the pears, ginger, lemon zest, 1 T. of the sugar, and 1/8 t. cinnamon. Stir together and let sit (macerate) at room temperature for 15 minutes. 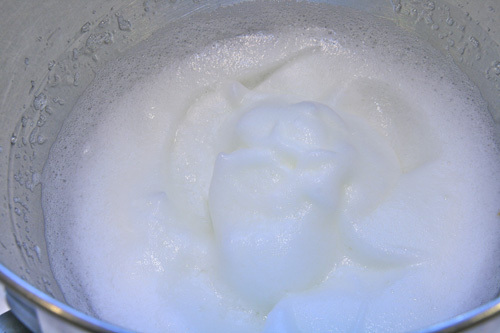 In a medium bowl, whisk the egg whites to soft peaks (see photo above). In another medium bowl, whisk the milk, 1/2 c. of the sugar, and the vanilla until the sugar dissolves and the mixture is slightly frothy. Whisk in the flour just until combined—it shouldn’t be completely smooth. With a rubber spatula, gently fold in the egg whites, and then fold in the pear mixture. In a small bowl, mix the remaining 1 c. sugar and 2 tsp cinnamon. The directions tell you to pour 1/2 an inch of oil in a cast-iron skillet, but I actually used a medium pot and it worked just fine. Use what you have. Clip a candy thermometer to the side. This is important. Your oil needs to get to 250 degrees Farenheit. Heat the oil over medium to medium-high heat. Layer paper towels on a cookie sheet near where you will be frying your dough. Once the oil is at 250, you can lower it to medium so the temperature remains steady and does not climb. Use a medium icecream scoop, which holds about 2 T. of the dough, to drop 3 scoopfuls of dough into the oil (ever so gently please!). Cook them on one side for two minutes. Do not crow the pot by putting in more fritters. They won’t fry as nicely and they will want to converge and meld together into one giant dough-ish ball. Not pretty. 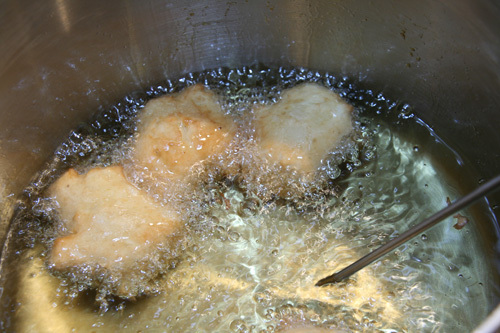 Flip each fritter over with a slotted spoon and cook another two minutes. Take the fritters out with the slotted spoon and set them on the paper towels. Scoop the next dough balls and repeat. 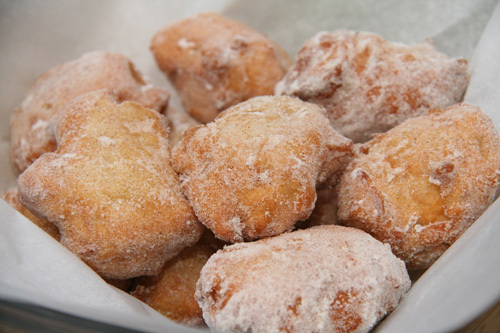 While those are frying, gently roll your fritters in the cinnamon sugar. Serve these guys warm…it’s the only way to go. The aroma coming from your kitchen will literally make you feel happy all day. Seriously, between the smell and taste of these fritters, your day will be stellar. Enjoy! Not diet-friendly, but they sound like a great treat. Funny thing though, I’ve never had a fritter or a funnel cake! Wow those pear fritters sounds and look spectacular. Good luck with your diet challenge! Your neighborhood certainly sounds like a fun, supportive community. I know, I don’t deep fry often, but when I do I do it BIG TIME! The ginger added a nice twist on it and made the flavor more complex. Hi, Geni. I must overcome my fear of (deep) frying and try these. Why is it that I keep seeing donuts all over the blogosphere lately? Is it officially donut season? Even in L.A.? It is ridiculously cold up here (snow on the ground even!! ), and donuts should be in order. These do look worthy of a cauldron of bubbling oil – not to mention the calories. 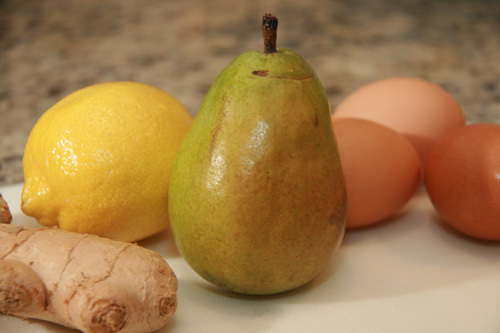 The photo of the pear, eggs, ginger, and lemon is superb! I finally got over my fear of frying with my last dougnut post and now I’m good with it. I use Canola oil and I only deep fry something once every couple of months so I think I won’t be turned into the health police YET. As for the photo….a HUGE THANK YOU! I took it MYSELF! I just rubbed my fingernails on my imaginary lapel. I was actually pretty proud of that shot if I do say so myself. Thanks for all the nice words. Hi Geni – Love the recipe and need to try this soon. From one biggest loser to another no one would be unhappy to receive these gorgeous looking fritters on their doorstep. I will make note of that. this looks so lovely geni.. i love having fritters anytime and this is now bookmark:) thanks for sharing. oh my! 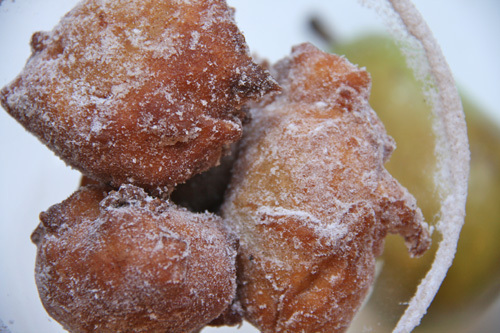 ginger and pear in a fritter? this looks siiinfully delicious. yumm. Just a big pot (like a stock pot and lots of fresh Canola or Vegetable oil). Thank you for your nice comment.